Output power rating: 500VA ~ 18kVA. Output frequency: 15Hz ~ 1.5kHz (61611/61612). Capable of delivering high CF current. Provide single and three phase output capability (61611/61612). Comprehensive measurement capability,V, Hz, Irms, Ipk, Iinrush, P, VAR, VA, PF, CF of current and etc. The Chroma Model 61600 series Programmable AC Power Source delivers pure, instrument grade AC and DC power at very low cost. The 61600 AC power source offers output voltage from 0 to 300VAC, and frequency from 15 to 1.5KHz. A easy-use software can let users edit an auto-run profile and record the measuring data during the test. It is suitable for commercial , avionics, marine, and military applications from bench-top testing to mass productions. The 61600 AC power source generates very clean AC output with typical distortion less than 0.3-0.5%. With power factor correction circuit, the 61600 AC power source yields higher efficiency and deliver more output power. 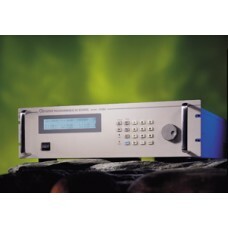 Using the state-of-the-art PWM technology, the Chroma 61600 AC source is capable of delivering up to 6 times of peak current verses to its maximum rated current which makes it ideal for inrush current testing. 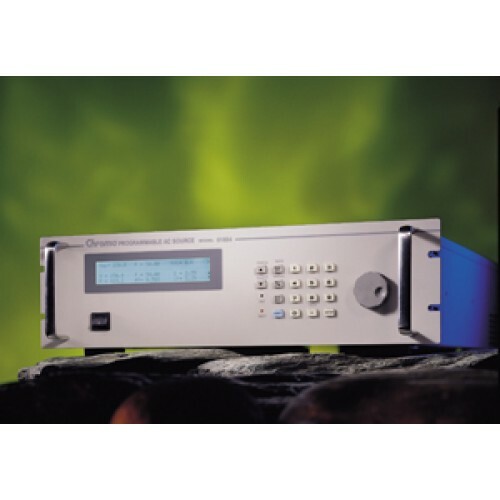 By using advanced DSP technology, 61600 AC power source offers precision and high speed measurements such as RMS voltage, RMS current, true power, power factor, and current crest factor. The DC and AC+DC mode extend the applications when users need DC voltage component. The 61600 AC power source also provides an external analog input, to amplify the analog signal from arbitrary signal generator. Thus, it is capable to simulate the unique waveform which observed in the field. With the LCD display and rotary nob, the Chroma 61600 AC power source offers versatile front panel operation. Users may also control the 61600 remotely via GPIB,RS-232 or APG(Analog Programming) interface. 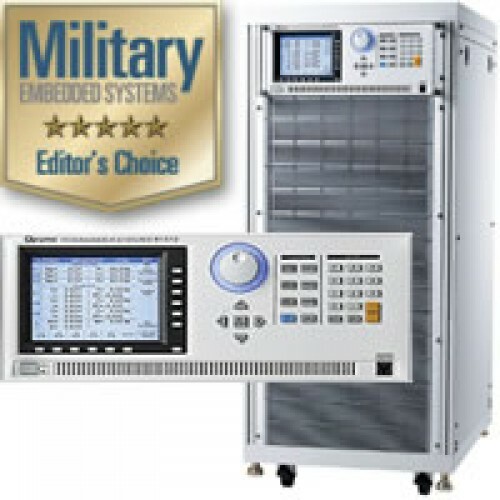 The self-diagnosis routine and the full protections against OPP, OCP, OVP and OTP ensure the quality and reliability for even the most demanding engineering testing and ATE application. The 61511/61512/61611/61612 AC source models provide the (Master-Slave) parallel operation function, which enable users to extend the AC source power output ability by connecting AC sources in parallel. The maximum allowable number of AC source implemented for the parallel operation is 5 units. Therefore, users can achieve a maximum power output up to 90KVA by combining 5 units of assorted AC source of 18KVA in (Master-Slave) parallel operation mode. The user could also use A615103 Power Stage as an alternative cost effective solution for the parallel operation, by implementing it as slave unit. Please refer to the following figures for AC source models 61511/61512/61611/61612 setup for parallel operation configuration.